Can Tiger don green and regain No.1 spot ? 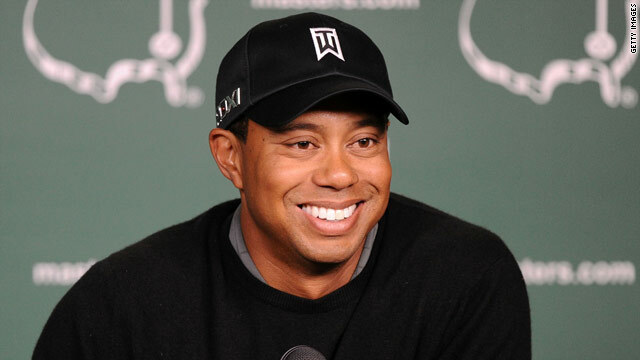 Tiger Woods was in relaxed mood at a press conference ahead of this week's Masters. Tiger Woods may have dropped to seventh in the latest world rankings, but should he secure a priceless victory here in Augusta on Sunday evening, his return to the top will be secured. In fairness, should any of the players ranked between two and seven - bar Paul Casey at six - don the green jacket this week then they all have a chance of reaching the summit after the conclusion of the year’s first major. Woods can NOT be discounted, swing-change or no swing change. His private life may finally be achieving the kind of balance that it needs, he told me in February, but what is undeniable is his sensational record here at Augusta National. Woods may not have won the Masters since 2005 but consider this, in the intervening period he has finished tied third, tied second, second, tied sixth and even last year, when he was “unprepared”, he finished tied for fourth. With all the furore surrounding his return 12 months ago, to get into the mix on the final day in the way that he did was all the more compelling. He is the greatest player of the modern era and is clearly going through a lot of changes with his swing, but admitted yesterday that he feels “almost ready to tee it up on Thursday." With Woods slipping off his pedestal, the battle for the No.1 spot in the world rankings has never been so open and gives added spice to proceedings this week. England’s Lee Westwood assumed the top spot late last year and held onto it through the off-season, until Martin Kaymer assumed the mantle of top dog at the World Matchplay Championship in Arizona six weeks ago. The German maintains that the world rankings are never a concern for those who play well: “The only ones who worry about them are those who begin to lose their form and play poorly," he told CNN recently. Although surprised to be in this lofty position for one so young, he clearly enjoys his new-found stature, and is realistic about his record here at Augusta National. He knows that it is of huge importance that he makes the cut, which he has failed to do in three previous attempts and would dearly like to record a top ten finish. It’s interesting to note that since the inception of the world rankings 25 years ago, the player in the top spot going into Masters week, has only emerged victorious five times and three of those wins were by Tiger Woods, the other two going to Wales’ Ian Woosnam and the people’s champion of old and still a crowd favorite here, Freddie Couples. But for the first time since 1997, when he sensationally claimed his first major title at Augusta, Tiger Woods goes into a Masters without possession of the No.1 ranking. Actions speak louder than words, however, and Woods knows better than any golfer, that the best way to silence any critics or doubters about his form will be with his clubs. It’ll be fascinating to watch. Tiger is a great golfer – the greatest before his scandal. His self declared policy of family first is a setback for him. Tiger will not make it. He must find a way to let his mother or someone he can trust to mind the kids. than he can free himself to score big. I wish him well. For I could be wrong. Good luck to you,Tiger. Tiger will never win another tournament....his head is too far gone. Let's hope Tiger does NOT get back to number one any time soon. His form since his comeback has been shambolic and there are many more deserving players among the number one contenders than him. Also, who needs all the hoopla that will come with his return to the top spot? Golf has been much more balanced and enjoyable since his dominance ended. After all that bad publicity, who's ever going to see him as a golden boy again? I don't even like Tiger Woods anymore. A lot of people don't. I think his ex wife needs to buy a voodoo doll that looks like Tiger Woods. Wow, seems like a lot of people here have a bit of a chip when it comes to Tiger. Now that we know that Tiger is in fact human, it is time to move on. He has answered to those deserving an apology and compensating those financially who were due. Golf today would not be where it is if it were not for Tiger, and you know this to be true. Enjoy the game and the varying weekly winners while he works through his slump and for those of you who fill as though you are incapable of making mistakes in life and that he should/won't ever be forgiven, standby! You obviously are not aware of just how much this guy dominated the game. Keep in mind, he is playing terrible with respect to the measure or level that he set , and look at where he has been placing. It won't take much for him to return to the top 5 and eventially No#1 again. My cube mate just made a very good point... How much would you be willing to bet that Tiger WON'T be No#1 at the end of the season? @ Erin; You said u don't even like Tiger Woods anymore, as though ur opinion counts. He never needed u. And to u folks u are still foaming about what he went through last year, I tell u now that ur hating him does not count. He doesn't even see u or know ur name. I would rather choose to love the poor man because he is human like me, and trying to be the best that he can be. The guy is nothing more than an overpaid pig and the media continues to glorify this creep. He needs to just go away. Erin, you need a psychologist to check your like and dislike. KiNG TIGER WOOD does not need you as a fan neither is your "like' for him an issue that deserve even a two(2) years ald attension. People sure like to kick him even when he's down. All that hoopla and noise is what brought the sponsors to the game of golf and propelled it to the forefront. Before Tiger came along golf was nothing more than a bunch of old frogs huffing and puffing away trying to make it up another hill to hit a little white ball. Who cared about golf before the Tiger era? NOBODY! He helped create a lot more millionaires and visibility for the game. The reason there are other number ones now is because Tiger's game is in a mess and NOT because the pretenders to the throne are genuinely beating him. It's undeniable that having Tiger Woods at the top of his game is very good for the game of golf whether you like him or not. His private life is his alone and it's nobody else's business. You're delusional if you think you have any say in it. it's most difficult for any sport player to come back from the kind of career-shattering experience Woods had – they eventually recover from it, but it takes a while. We must all commend the guy that he was able to face up to his misdemeanours and pick himself up to start over again – that is the hallmark of greatness! Never wish a person bad in any circumstances! We all make mistakes and yep very dumb ones but you have to back of folks and let them live! I too wish TW all the best to go out play golf get the Green Jacket and take Nmber One! Yes. I am absolutely sure that he will become the No 1 again. He neatly overpowered all his rivals to climb at the top. Despite the fact that he failed to survive his marriage, he won't fail to regain his real position. His record at Augusta doesn't mean anything until he finds his game. The whole of last year, he played at a number of courses where he has a great record and fared poorly. Right now, there are many who are playing much better. Until Woods finds his game and starts dominating again (assuming that will happen), maybe CNN should write about those who ARE playing well. T.WOOD w'll come back soon! Tiger Wood has tried enough in the golf world.He will still do it again. He is the best black golfer i have ever seen in my life.I wish him good luck in his career. Tiger will definitely regain the number 1 world rank sooner than later. I expect him to win his 5th jacket. Tiger's skills can never be matched by the present crop of wannabes. Sorry to the Tiger-bashers. Wish you all the best Tiger! Clearly, CNN patrons don't know a darn thing about Professional Golf, apparently. Meanwhile, the fake, phony moralists of our day, pretend as if they are in a place in life to judge others. Look, people – not one of you can claim moral high ground on Tiger Woods, or anybody else for that matter. If YOU were to hold a Global Press Conference and be forced to give an account for your life, there would be plenty of Bats and Skeletons flowing out of your own Moral Closet. Yet, you sit here, like the total hypocrites you are, and pretend to have such moral clarity in life, that you can actually judge another on moral grounds. How, painfully idiotic is that. Second, Tiger Woods, is undergoing MASSIVE swing changes. That means, his club-head path to the back of the golf ball has changed. How many people do you know, are capable of bringing their C+ game with them to the Masters and mechanical swing changes, while storming up the leader board on Sunday, to take a share of the lead? Answer: No one! You have to be a Master yourself (of the game) in order to pull that off. Tiger, nearly one is 15th Major with nothing better than his overall C+ game. Lastly, the hypocrisy in America is staggering. None of you Professional Hating Hypocrites have the moral bandwidth to challenge anyone on their character or their integrity. So, each time you post something negative about Tiger, you do nothing but destroy your own character in the minds of intelligent human beings around the world who know perfectly well just how flawed they truly are. You are nowhere near Perfection. Tiger, before his moral lapse, had done more for people around the world through Charity, than any of you ever will in your entire lifetime – so, if we are TRULY keeping score here, then I'll take Tigers moral transgressions + his work to improve the lives of young people around the world, over YOUR phony hypocrisy the pretense, any day of the week. Much congratulations to Charl, on becoming the 2011 Masters Champion. He earned it, just like Tiger earned every last one of his 15 Majors and 80+ PGA Tour Victories. Unprecedented in his generation. Not to mention the fact the Tiger has single handily brought more people into the game/sport of Golf, than any other human being in history, including both Jack and Arnold combined. Countless other records, including highest number of PGA Tour Player of the Year Award and the Byron Nelson Award. 3rd, All Time Winner on the PGA Tour and 38 European Tour wins, which places him 3rd All Time Winner overseas. And, this does not even begin to touch his Wins as an Amateur, which has never been replicated by any human being on earth. All the irrational hate being spewed towards Tiger, by hopelessly imperfect people, does nothing but demonstrate just low such people will go to destroy their own character and integrity – or – more to the point, it exposes just how little character and integrity those kinds of people had from the very beginning. Rest assured, the Professional Tiger Hating that goes on in this country, says a whole lot more about the haters themselves, then it ever will about Tiger the man. He's made his mistakes, admitted his failures, sought the help he needed, made the appropriate course corrections in his own personal life, assured that his children are well cared for, apologized to his former Wife, family, friends, peers on the PGA and sponsors – and then Tiger moved on with his life, precisely as he should. Anyone, still harping on something that happened a year ago, must have skeletons in their own Moral Closet that they wish to hide form the rest of the world, because there most certainly is no value whatsoever in regurgitating the same tired trash that so many phony moralists seem to think has relevance. Only a total hypocrite thinks otherwise. Since you have reached the age of accountability, what moral lapses have you put forth in your life? It is a very simple question that the hypocrites will no doubt avoid. Ask the Tiger Hating Hypocrite this question, and all of a sudden, they tuck tail and stop posting, because they know full well that their life could NEVER stand the spot light of a camera and a microphone. So, if you have Moral Failures in your own life, how on earth can you sit in perpetual judgment of another? How can the morally imperfect, sit in judgment of the morally imperfect? The problem with these fake, phony moralists, is that they are so blinded by their hate and so irrationally discharged in what they think is their duty to penalize Tiger, that they cannot see the holistically irrational and illogical premise upon which they launch their own insane attacks. It is 100% circular, for the morally imperfect, to think that he/she can sit in moral judgment of that which is likewise, morally imperfect. Everyone of us, since reaching the age of accountability, has done something in our lives that we are morally not proud of, and do NOT want to talk about or have to reveal to the light of day, during a Global Press Conference. So, all you miserable hypocrites out there in the Land of Strong Delusion, who have fooled yourselves into actually thinking that YOUR life is the Model of Moral Perfection, you really do need to put down the coolaid, because the only way for you to actually believe that delusional hype, is for you to have brainwashed yourself to the point of being a hairs width from full frontal lobotomy. NONE of you are that Morally Pure, or that Morally Perfected in your adult lives. You can sell that Pipe Dream to the nearest Oil Barron, but you cannot sell that bull to me, nor can you sell it to ANY real human being walking the earth today. Your hypocritical problem is that you are so ARROGANT as to actually believe that YOUR moral transgressions are somehow "cleaner than Tiger's" and therefore, YOU are held to a different standard of morality. Wake Up! None of you are any more Moral that Tiger's left index finger – None of YOU hypocritical people are that moral in your own right. So, quit pretending to be morally outraged at what Tiger has done. You have enough skeletons in your own closet and enough bats flying around in your own personal Moral Attic. Professional Golf is about Professional Golf. It is about winning more than the next guy/gal on tour and NOTHING else. Professional Golf is NOT a Morality Play and YOU are not a Morality Judge. You are not clean enough to judge Tiger Woods, or anybody else on moral grounds, for that matter. It is simply foolish and massively arrogant to think otherwise. Yes – let's put that Moral Microscope on top of YOUR life and see how long it takes for the other shoe to hit the floor. How much sin is in YOUR own life? How much moral backbone do YOU have in YOUR life? If you have just one moral lapse, then you are no better (probably FAR worse off) than Tiger, or me, or anyone else. O' Ye Hypocrites! O' Ye Pretenders! O' Ye Fake Moral Agents of Model Perfection! O' Ye Deluded People! The Great Pretenders. Pretending that YOU are doing well in your life, with zero moral challenges - ever. Go sell that nonsense to somebody who does not know any better. I KNOW you are not Morally Perfect in your life. What I don't know, is where the heck you imperfect people, get off on thinking that you own the moral ground sufficient to judge another on moral grounds. That's what I don't understand. There are few things worse in life, than moral hypocrite sitting in moral judgment of another human being. Who the HECK to do you phony people think you are? You are morally UNCLEAN yourself, yet you can sit in judgment of Tiger Woods? On what planet does that wash out as being logical, rational or anywhere near reasonable? Thus, your hate for Tiger, obviously comes from another source. That much, is crystal clear. You don't hate him because he had a moral lapse, you hate him for a distinctly different reason – clearly. And, that truth is abundantly obvious at this point in the conversation. The most important question is....what makes you hate him??? So please stop these crap hatters talking, we are talking about golf not about somebody's personality, it is not our right to judge others as long as we are still evenly human!!!!! HE'LL BE BACK to CLAIM HIS THRONE!!! @Tiger Hater:....I'm 1000000000000000000% with you........they all who talk bad about Tiger has no idea about what they are talking about, they all have a major IQ problem........they all pretenders.....and I do believe that they all could've done worse than what Tiger did!!!!! For those who talk bad and judge Tiger so badly, I think you better sign up for a Human Living Brain Donor!! !